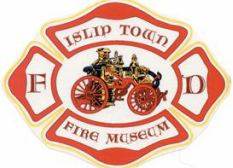 The Islip Town Fire & EMS Museum and Education Center will be hosting a historical presentation on Friday, February 23rd from 7:30 - 9:00 PM - join us for "A Glimpse Back in Time" showcasing the history of the communities of Islip and East Islip including their volunteer fire departments (the first two organized within the Town of Islip). Join us for this 90 minute presentation narrated by George Munkenbeck, Islip Town Historian and Tom Rinelli, Historian for the Islip Town Fire & EMS Museum and Education Center. The presentation will be held at the Islip Town Fire & EMS Museum and Education Center located at 4 Courthouse Drive in Central Islip (directly across from the Long Island Ducks baseball stadium - use "Bethpage Ballpark" for GPS). Free parking is available in the county parking lots located immediately west of the museum. For questions regarding this presentation, contact Museum Historian Tom Rinelli (firescueguy@gmail.com). our non-profit, private facility dedicated to the preservation of the rich history of the volunteer Fire & EMS services serving the Town of Islip for over 125 years.